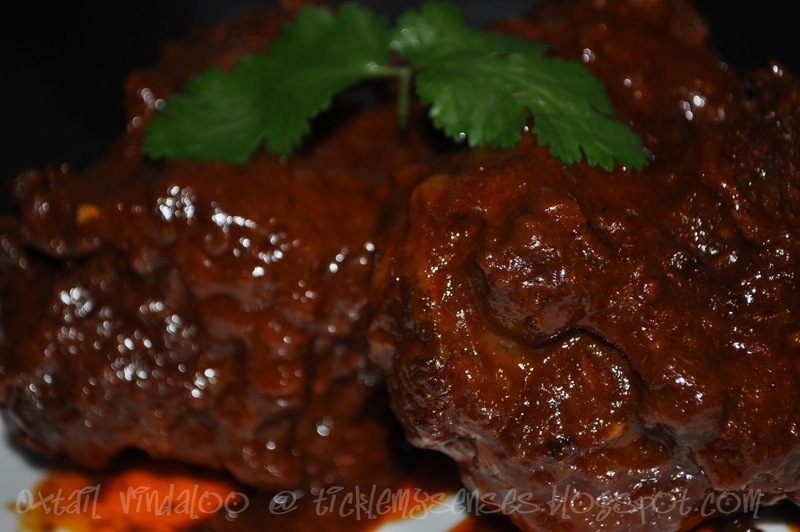 Tickle My Senses: Hot, Spicy and Divine Oxtail Vindaloo and its Back to Work again!!! Hot, Spicy and Divine Oxtail Vindaloo and its Back to Work again!!! "Wow that's the best dish you've ever made"......exclaimed hubby after he had one bite of this "Melt in the mouth" oxtail cooked in a hot, enticingly spicy and simple Vindaloo curry. Must try it to believe it! Oxtail is a bony, gelatin-rich meat, which is usually slow-cooked as a stew or braised. It makes a delicious soup too. Oxtail (occasionally spelled ox tail or ox-tail) is the culinary name for the tail of cattle. Formerly, it referred only to the tail of an ox or steer. An oxtail typically weighs 2 to 4 lbs. (1-1.8 kg) and is skinned and cut into short lengths for sale. Well I made this vindaloo curry last weekend, and so much has happened since then, that I had no time to blog this recipe until now.....phew........Im tired....happy tired...and cant wait to go to bed!!!! but first ive got to share the happenings of this week and this delicious recipe with you all. So here it is .....Oxtail Vindaloo before sleep takes over............I hope you enjoy.....do let me know what you think of it!! My pillow's calling..so cheerio.....goodnight!! 3. 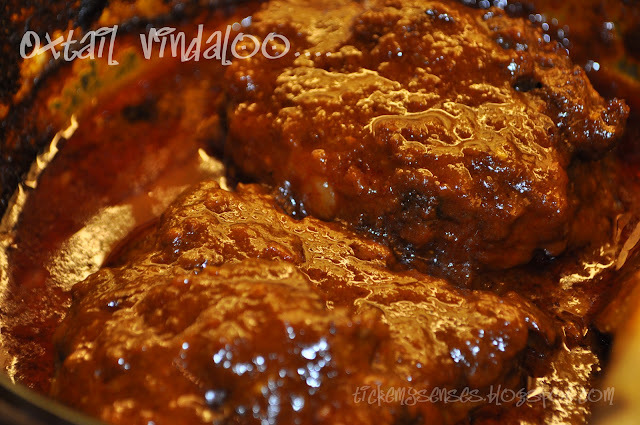 Heat 2–3 tablespoons oil in a pan on a medium-high heat and brown the oxtail, until well browned all over and any fat on the surface is rendered out. Place the browned oxtail in the bottom of a pyrex dish. 4. Drain and discard all the rendered fat from the pan and place back on the stove.Pour in 2 tbsps of oil and fry the onion till golden brown. 5. Add the ginger garlic-garlic paste and sauté for some time till the raw smell dissappears. Add the spice paste to the fried onion mixture ( made by making a paste of all the spices with a little water), fry for a minute then add the tomato puree and continue frying till the oil separates from the spice paste. Add the vinegar and bring the mixture to a boil. 6. Pour the spice mixture over the browned oxtails in the pyrex dish. Add enough hot water to completely cover the oxtails. Place covered in a preheated oven and bake at 200C for 30 mins. 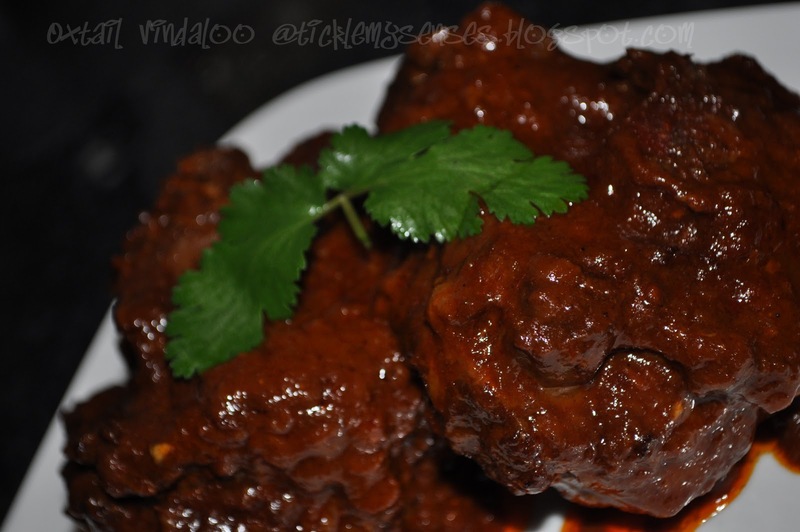 Turn the oxtails over and then reduce the oven temperature to 170C and cook for further 1 and a half hour or until the oxtails are well cooked, tender and easily fall of the bone, and the gravy is thickened and rich. Check the liquid level from time to time, adding more water if necessary. Taste for seasoning, allow the meat to rest for a few minutes before serving with a slice of french bread and a healthy salad. Hola Cay. Este tipo de carne por aquí es muy conocida y en algunas ciudades de España lo preparan a las mil maravillas. Yo cuando lo pruebo me gusta pero especialmente me gusta la salsa que lo acompaña. El que tu has hecho tiene una pinta fabulosa. Está para chuparse los dedos. Untaría mucho pan en esa salsa. I love oxtail and this one seems so delicious! Thankyou Aarthi, Anne, Juan, Elpiniki and Divya.....I hope you try and enjoy!! Gracias Juan por tu comentario preciosa. Espero que trate esta versión y disfrutar de ella! Very tempting click & it looks so spicy & rich! Yum! !